We make good music, great leaders, and amazing human beings. Plain and simple. FUN FACT: They're all CHS alums! 1. We are respectful and accepting of everyone. 2. We are always working, constantly learning, and progressively growing. 3. We are a class act, everywhere we go, representing the Minutemen. 4. We are present, here and now, living for the moment. 5. We are a team. We are a family. We are strong as one. Folsom Jazz Festival bright and early tomorrow! In need of a new mattress? 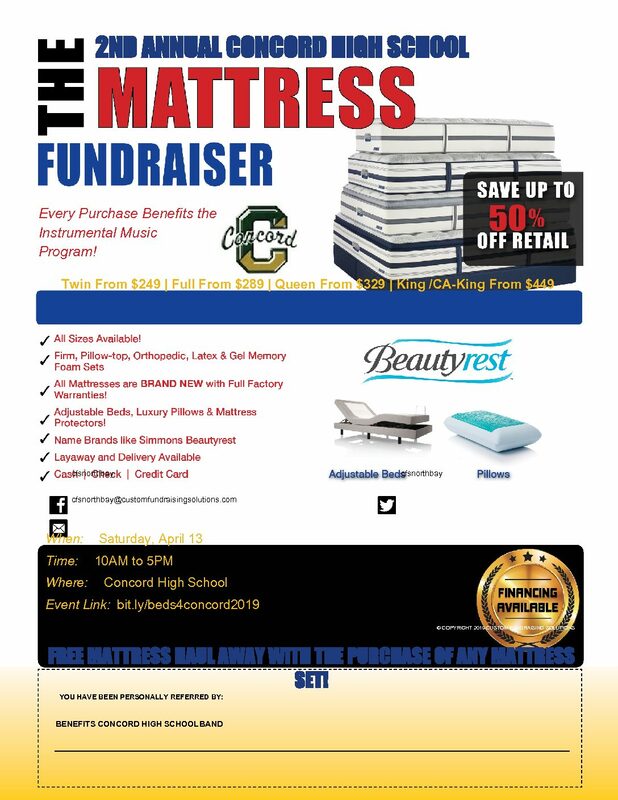 CHS becomes a mattress showcase on Saturday, April 13, from 10am-5pm. Mattress prices are greatly reduced because there’s no overhead cost. Spread the word. You’ll find all the big name brands. Music families and the CHS Instrumental Music Program benefit for each mattress sold…. Marching Band and Auxiliaries will make one final March this year, leading the way for Santa’s arrival in Walnut Creek on Thursday. Bundle up and come on down for a festive show! Broadway Parade of Lights itinerary. A message from Mr. Lejano Hello CHS Instrumental Music students, I know that we had planned for a get-together this Saturday in place of Fairfield’s TOC, but due to the air quality progressively getting worse, I unfortunately have to announce that we will cancel this Saturday’s celebration at the school…. Thursday, 11/15, our Jazz Ensemble and the MDUSD Honor Jazz Band (featuring CHS musicians) performing along with other district high schools. Location: Diablo Valley College’s Performing Arts Center. MDUSD Jazz Fest 2018 Itinerary.